Helensburgh Community Council | Argyll & Bute Participatory Budgeting - ends 30th April! Argyll & Bute Participatory Budgeting - ends 30th April! The deadline is fast approaching for you to have your say on how money from A&BC's Supporting Communities Fund is spent. To make your views count, visit http://abpb.argyll-bute.gov.uk and vote for which projects you would like to see funded. 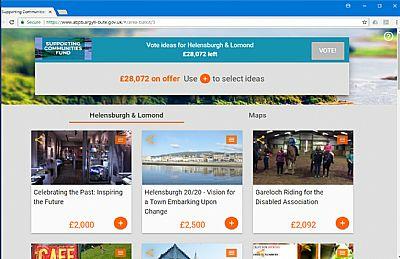 Residents aged 16 and over can vote for as many projects as they like, up to the total value of funding available of £28,072 in Helensburgh and Lomond. JLB INNOVATION HUB IN HELENSBURGH LIBRARY : for a Feasibility Study & Business Plan. HELENSBURGH 20/20 : A Vision for a Town Embarking on Change, to create a Community Action Plan. A user's guide to voting is attached. Please vote before 30th April!